With the Standard Chartered Marathon Singapore 2017 ended earlier this month, my Hall of Fame 2017 is completed. This year, I ran for 8KM, 10KM and two 21.1KM. They are the CCK Big Farm Walk and Run, Sundown, 2XU and SCMS. It is a real excitement to run in these marathons especially when I feel being able to run and complete the race for the prestigious marathons in Singapore. Why I want to run a marathon when we can just run in the park for free? Well, it really gave me a different experience when running alone in the park, running alone during the race and running with thousands of people. The race’s route, weather, atmosphere and people are different during each race. For example, running for an half marathon, the race will begin around 4.30AM in the morning. It is cooler and windy when run at this hour as compared to a 10KM marathon which usually begin at 7.30AM when the sun arises. Besides that, it tests our endurance during the race, determination to complete the race and satisfaction and sense of achievement upon crossing the finishing line. The feeling of running toward the finishing line is great especially you are cheered by strangers standing along the street and keep telling you, “it is almost there, 100m away, come on keep running” and when you are very close to the finishing line, someone will shout “just another 5 seconds of running!”. Sometimes, we could get consolation prize when the person next to you congratulate for your victory. Having group picture after the marathon to show off medal. It is a great moment to be captured and shared in the Facebook and Instagram. Unfortunately this SCMS, we did not manage to take a group picture together at the race village when my running partners flagged off at different timing then mine due to two of them were at the baggage deposit area for an hour. Anyway, we are planned to meet up for the post marathon dinner or pre-Christmas gathering, it is just giving ourselves an excuse to meet up again! Do I stop at each kilometer signboard to take picture? Yes, in my earlier years when I started to run and I got to know a friend at one of the signboard when I ran for Standard Chartered KL in 2015. However, right now I did not do it anymore. These signs reminds me that I have completed 1st quarter of the race, 1/3 of the race, 1st half of the race and 3/4 of the race which give me a positive thought to complete the race with determination. 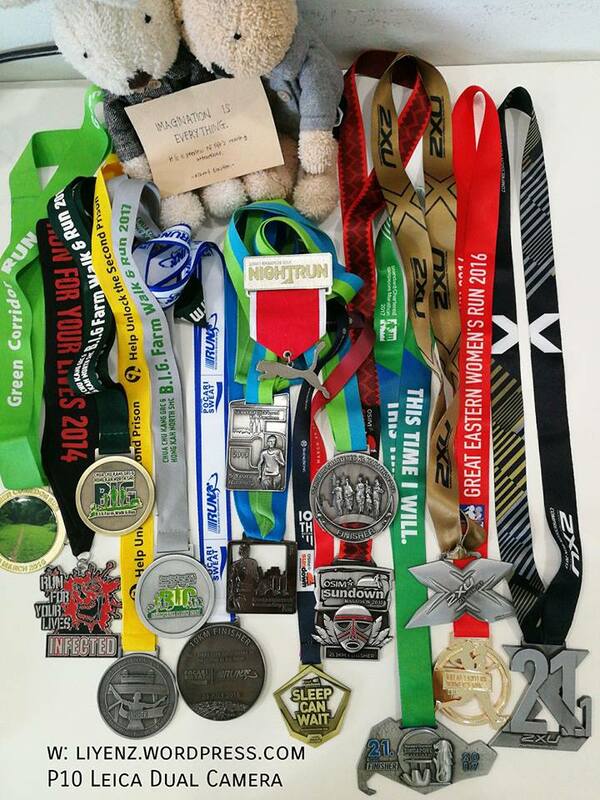 I will feel of signing up for the next marathon each time I completed one. Yes, I am keeping a close check on the RunSociety for the next half of the year 2018’s marathons. I am not too sure if I will still continue running for Sundown or 2XU for next year, however, I am interested to run for other marathons which I have not tried before. One of it is the Income Eco Run 2018.